We have avoided stocking much of this product for awhile now due to the best expiration date available to us is mid Jan. 2019. The product won't go bad on the expiration date under normal circumstances, but most customers do not want to buy short dated product. If, however, we have enough people who want us to order some in for them despite the expiration date, we will order more. We do have one box of ten on their way soon at the moment though, so if you want to preorder, call in during business hours and we will take an order and ship when it comes in. Ph. 870-387-7611 8a-5p Mon.- Thurs. and 8a-4p Fridays central time. MERCK ANIMAL HEALTH Intervet Inc. This product contains live oocysts of the following species of coccidia: Eimeria acervulina, E. brunetti, E. maxima, E. mivati, E. necatrix and E. tenella. 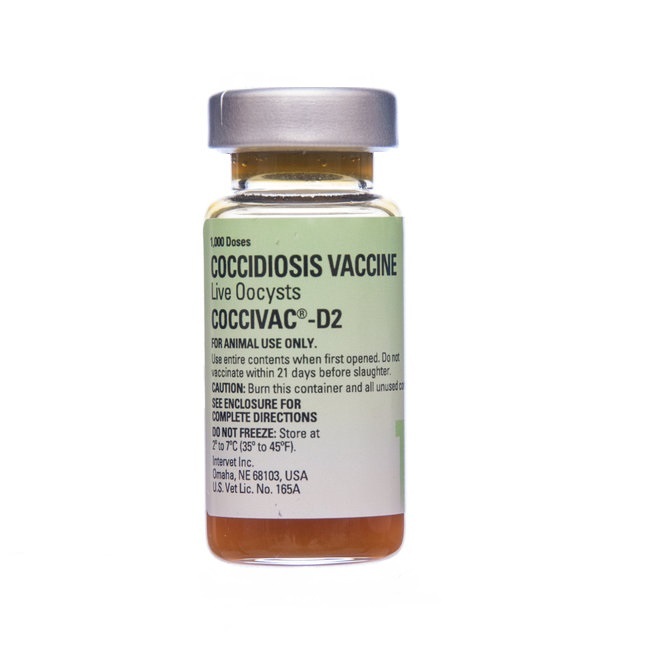 For vaccination of healthy chickens at 1 day of age by spray cabinet administration or at 4 days of age on the feed as an aid in the prevention of coccidiosis. Many factors must be considered in determining the proper vaccination program for a particular farm or poultry operation. To be fully effective, the vaccine must be administered to healthy receptive chickens held in a proper environment under good management. In addition, the response may be modified by the age of the chickens and their immune status. Seldom does one vaccination under field conditions produce complete protection for all individuals in a given flock. The amount of protection required will vary with the type of operation and the degree of exposure that a flock is likely to encounter. For these reasons a program of periodic revaccination may be required. The vaccine should be prepared (or mixed) at the rate of 210 ml of distilled water per 1000 doses of vaccine. Each 100 chicks should receive 21 ml of vaccine solution (dye may be added as a marker). Full Directions for use of the Spray Cabinet are available from the Company. 1. Do not use any medicated drinking water or water disinfectant 24 hours before and after vaccination or during vaccination. 2. Feed sprinkled on paper under the feed line increases the exposure of chicks to the vaccine. 3. Dilute the vaccine at a ratio of 1000 doses/400 ml of non-chlorinated water. Mix well and place in a clean garden type pressure sprayer. 4. Spray the diluted vaccine over the surface of the feed. Agitate the sprayer during administration. 5. For best results, the vaccine should be sprayed on all of the feed just prior to consumption by the chickens. 6. Avoid wetting the feed. Proper application will only dampen the surface of the feed. 7. Allow the chicks sufficient time to ingest the oocysts on the feed before placing more feed in the pans or on the paper. Consult your poultry pathologist for further recommendations based on conditions existing in your area at any given time. This product is not ordinarily recommended for use with prestarter or starter feeds containing coccidiostats. Birds must have access to their droppings as reinfection is required to induce immunity. 1. VACCINATE ONLY HEALTHY CHICKENS. Although disease may not be evident, other disease conditions may cause complications or reduce immunity. 2. Use entire contents when first opened. 3. Do not vaccinate within 21 days before slaughter. 4. Store at 2° to 7° C (35° to 45° F). Do not freeze. 6. FOR ANIMAL USE ONLY. This vaccine has undergone rigid potency, safety and purity tests, and meets Intervet Inc., U.S. and local requirements. It is designed to stimulate effective immunity when used as directed, but the user must be advised that the response to the product depends upon many factors, including, but not limited to, conditions of storage and handling by the user, administration of the vaccine, health and responsiveness of individual chickens and the degree of field exposure. Therefore, directions should be followed carefully. Keep a record of vaccine, quantity, serial number, expiration date and place of purchase; the date and time of vaccination; the number, age, breed and locations of chickens; names of operators performing the vaccination and any observed reactions.